The RDN and residents of Nanoose value sustainable water supply within the area. To better understand water in Area E, the RDN is working to collect more data and better information on local groundwater and surface water. Long-term monitoring of wells and streams will enable trends to be observed and management practices to be based on the state of the water resource. 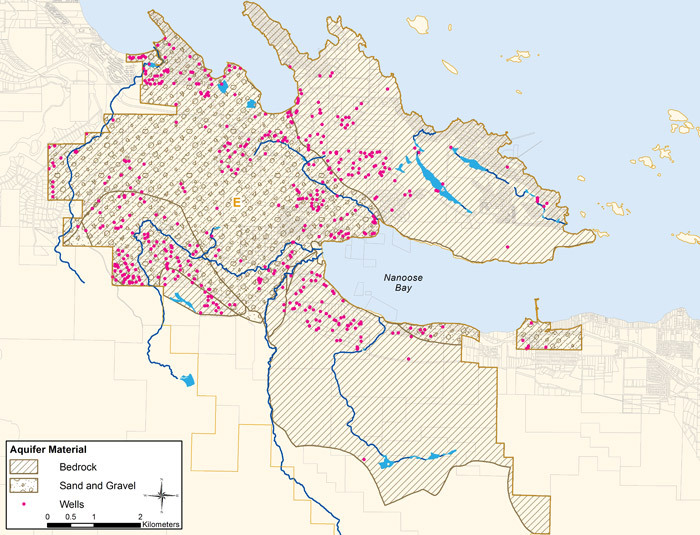 In 2013, a preliminary Water Budget Study for the Regional District of Nanaimo was completed. This Nanoose-specific monitoring program is a follow-up to the regional water budget study, focusing on this sub-region. This Nanoose (Area E) Water Monitoring will see expanded data collection within the geographical area, resulting in a higher resolution understanding of groundwater and surface water characteristics in Nanoose. This will enable more accurate water budget calculations that look at supply, demand and resulting stress level. Ultimately this information will be used to support sustainable development decisions and protect water resources over the long term. Phase 1 of this long-term monitoring program commenced in the Parker Road area of Nanoose, in the immediate vicinity of where a new RDN water service area well is located. The objective of this phase 1 monitoring program is to understand long-term capacity of the aquifer and determine sustainable operating parameters for the RDN well, so that the wells in the surrounding area are not significantly impacted. Monitoring of volunteered private wells for phase 1 began April 1st, 2015 and continues to present. Water levels are tracked with a data logger in each well, to understand impacts of pumping, seasonal changes to do with climate and long-term trends with both. Electrical conductivity is monitored in some of the coastal wells to gauge if there is concern with saltwater intrusion occurring. In 2016 a water monitoring plan for Area E as a whole was developed; click here to see the report. In the summer of 2017, 5 new volunteer observation wells will be added within the area, to fill spatial gaps in groundwater level data. A streamflow monitoring station has also been added on Nanoose Creek as of February 2017. (UPDATED SEPTEMBER 5, 2018) The following graphs are for the wells monitored in the Parker Road area as a part of this program. Individual well owners know the unique identifier for their well so they may look-up their results. 'B' stands for bedrock and 'O' stands for overburden. The data displayed in the graphs shows groundwater elevation (water level), rainfall (from the Fairwinds Golf Course rain gauge), and electrical conductivity (EC) where applicable. Data has been collected since April 2015 and these graphs are now current to February 2018. Note that well B8 withdrew from the program in Oct. 2015. Not pumped again until Jan 30, 2017 where it came into operation, pumping at 30.8 igpm. May 25, 2017 pumping rate was slightly increased to 37.4 igpm. July 4, 2017 pumping rate was slightly increased again to 39.6 igpm. August 14, 2017 pumping rate was decreased back to 30.8 igpm. October 6, 2017 well was taken off line. July 25, 2018 well was brought online, pumping at 32.9 igpm, now averaging 30.7 igpm. September 7, 2018 well was taken off line. Water levels in the bedrock wells, particularly in the summer months, are influenced by the cumulative effect of all bedrock wells pumping in the vicinity. Water levels in the overburden (sand and gravel) wells do not appear to react to pumping in the bedrock aquifer. The next data download will take place in fall 2018. Further background info: The purpose of the 72 hour pump test was to intentionally stress the well in order to understand the connection and response in other nearby wells. This is standard professional practice in well assessment procedures. The 72 hour pumping test was run at 105 US gpm, which is a much higher rate than a community well would ever be operated at. The test was successful in identifying relationships between wells that will allow us to determine safe, sustainable operating rates for the well that will not significantly impact the functioning of neighbouring wells. Please note that short term deviations in conductivity readings in the proposed community well during the 72 hour test is largely due to instrumentation errors and re-calibration resulting from flow velocity changes at the beginning and at the end of the test. Also note that during the 72 hour pump test, all data loggers were reprogrammed to collect water level readings at 1 minute intervals. Therefore if the water level graph looks different in the wells between Oct. 19-26, it is for this reason; there are more data points being recorded and so more pumping events are observed in the graph. Results of the first year of monitoring (April 2015 - April 2016) provides a baseline understanding for the 15 wells in the Parker Road area. This analysis is included in the report: "Rating and water quality of the proposed community well at 2729 Parker Road after a 72hr Constant Rate Test; and results of 1-year Baseline Monitoring of 15 Wells". [ CLICK HERE ] for the report. Please direct any questions to the contact form at the bottom of this page.